Futoshiki is a puzzle game that's a step up from Sudoku, adding inequality into the brain-teasing mix. It is also known as Hutosiki. Just like Sudoku you must fit digits into a grid of squares so that no digit is repeated within a row or column, but unlike Sudoku the 3x3 squares are replaced with greater-than and less-than symbols. The puzzles can be any size, such as the 5x5 example on the right here. From just the one pre-filled number you must fit the numbers 1 to 5 into each row and column so that the inequality signs are obeyed. 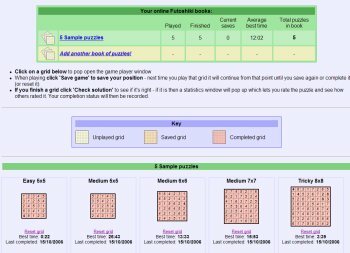 Or play a wide range of other puzzles, including Sudoku, Hanjie, Hitori, Slitherlink, Killer Sudoku and many more at puzzlemix.com. Playing Futoshiki in the unique dofutoshiki.com player is even easier than with pencil and paper. 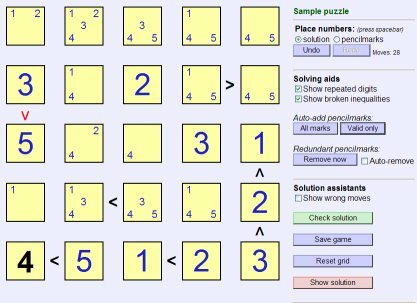 You can place both final and 'pencil mark' numbers (working-out to help you decide which numbers go where), and you can resize the puzzle grid as large or as small as you choose. You can even save the current puzzle state at any point, complete with pencil marks, and return to it later. The dofutoshiki.com puzzle browser keeps track of your online puzzle collections and shows which puzzles you have played, saved and completed. Saved games can be accessed from any computer you log in on. I can create Futoshiki puzzles at any size and difficulty and supply them in press-ready PDF or other formats. For more details and a bibliography of my many published books and magazines, please see www.puzzlemix.com.